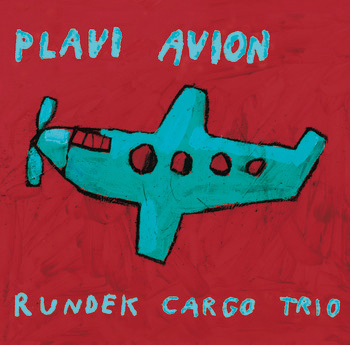 BLUE AIRPLANE is the Rundek Cargo Trio's first album. The songs break away from the usual structures to explore more open, improvised and storytelling regions. The loose arrangements leave room for each of the three musicians to inject their own expression. You can buy it in CD-shops in Bosnia&Herzegovina, Croatia and Serbia or download it at Amazon or Deezer. The majority of songs included on the melancholic but truly wonderful 'BLUE AIRPLANE' by the Rundek Cargo Trio (Rundek, Isabel, Dušan Vranić-Duco) seem to fly over the nest of 'toms and strings' towards a better world. But the sadness persists, because what might seem from our point of view like a bohemian life in the French capital, perhaps seems to Rundek like the clandestine wanderings of a Kurd in Paris: Suggestive images lead us from Trešnjevka place (Zagreb) over dark mountains and down to the troubled river Drina, from a lullaby with whisky and Chet Baker to a gig on the street, from life in exile to the dusk of capitalism. But even if we don't understand all that Rundek is telling us in his recognisable theatrical style, always slightly under or over the melody's key, still we can, like those who don't understand croatian, enjoy the fascinatingly rich musical language which just three musicians squeeze out of their instruments. And within that universal language which defies all barriers, there are all sorts of styles; from reggae, blues, jazz and folk-rock, to arabian and middle-eastern; with motifs from the Andes, to eastern Europe. With all these influences 'BLUE AIRPLANE' remains authentic thanks to the calm and attentive way that the Cargo Trio develops the melodies and arrangements, sometimes with only accoustic guitar, violin, drums and accordion. Despite a general feeling of chaos, pessimism and depression, Rundek is one of that rare breed who have kept the sense of existing. Vecernji list - Zagreb 28.11.2010. Having listened to the new album 'BLUE AIRPLANE' the worldly travels from Rundek's previous albums have clearly widened to take in 'Kurdistan', 'Ruskaja' and parts of Bosnia in 'Drina'. At the same time his well known framework of theatrical, expressive folk-rock remains; and in these digital times it's good to distinguish the sounds of wood being blown and strings being strummed. 'Indian Song' is the album's first single, but it is not really representative of the general style of the album, which is dominated by lengthy tracks of six, seven, and even fifteen minutes; this is essentially an album of atmospheres as evoked in the high quality title song. With excellent songs like 'Fight with the Forces', 'You Dreamed that you're Happy' and 'We Plant the Linen', there is such a harmonious blend of the artistic and radiophonique that the forthcoming concerts promise an update of favourites.